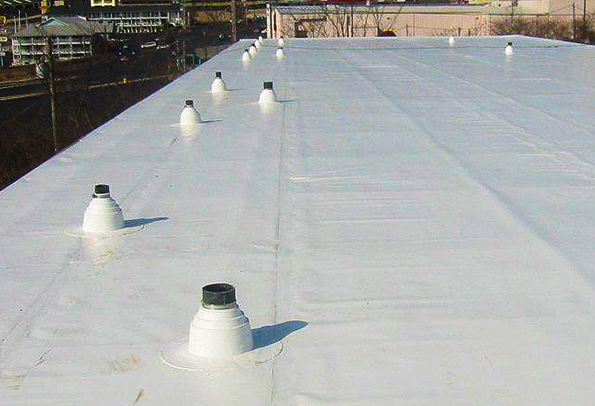 Single ply roofing provides a durable yet flexible solution for commercial buildings and flat roofs. Your roof is the first line of defense for your home against everything Mother Nature can throw at it. Single-ply roofing provides protection in several ways while also giving you an eco-friendly alternative that helps conserve energy use. Single-ply roofing is a little more expensive than the traditional shingle-style roofing, but will save you a great deal of money during the lifetime of the roof, and can last much longer than old-fashioned shingle roofing. If you're interested in single-ply roofing for your commercial property, Precision Roofing Services can help. We install high-quality single ply flat roofing and other commercial roofing products throughout Greater Lansing. Call us today or click below for a free cost estimate! Single-ply roofing is an all-synthetic material usually composed of plastic or thermoplastic composites. 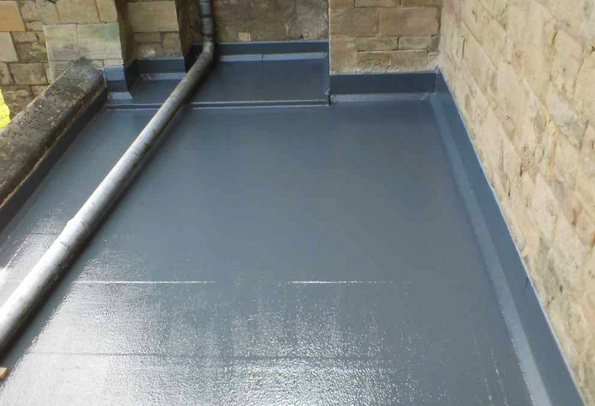 The benefit of thermoplastic over plastic single-ply roofing is that thermoplastic materials can be heated repeatedly without damage, allowing the seams to be welded together on your roof so a solid line of roofing prevents leaking between pieces. Single ply roofing provides long-lasting quality and some of the best weather resistance. PVC is one of the oldest and highest-rating forms of thermoplastic single-ply roofing, and is heat-retardant and hard to break or tear. It also comes in long sheets that have fewer seams to weld, and offers better protection than overlapping shingles or liquid sealers. PVC roofing has a long life expectancy; like most single-ply roofing, it will last 20 to 30 years-a good deal longer than shingle or liquid roofing. Thermoplastic polyolefin is a new addition to the single-ply family of materials. It can be harder to install on angled roofs or roofs with many corners because it's stiffer and harder to cut, but it has an expected lifespan of 20 years. The longest-lasting form of single-ply roofing material is EPDM (ethylene propylene diene terpolymer). It's also the highest-rated in energy efficiency and is resistant to weathering from UV rays and ozone. It has an expected life of 20 to 30 years, but there are EPDM roofs that have lasted as long as 40 years. Single-ply roofing is relatively easy to install. For larger, commercial buildings or rental units, it eliminates the need to heat up big vats of tar or other sealers, and is cleaner and neater. The bigger benefits of single-ply roofing are the energy savings this type of roofing provides. It insulates better than liquid sealers, and doesn't allow leaks the way shingle roofing does. The leaks that happen with other forms of roofing products not only endanger your home or commercial building with incoming water, but allow drafts into and out of the building, making it harder to control the environment inside. Single-ply roofing is also easier to install in unusual roofing layouts. If you're looking for a durable, energy efficient roofing solution for your commercial property, call Precision Roofing Services today. We provide free cost estimates on all our work, and we have the right roof for your needs. We proudly serve in Okemos, Lansing, Holt, Charlotte, Owosso, Mason, Williamston, Dewitt, Grand Ledge, Fowlerville, and throughout the surrounding areas.